IM Amon Simutowe prepares for upcoming tournaments!! Tamara Luhanga, "Simutowe to Prepare for Chess Tourney," The Post, 12 June 2002 (Lusaka, Zambia). 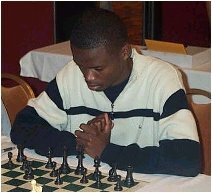 ZAMBIAN chess International Master Amon Simutowe says he will play a few tournaments to prepare for the World Junior Championships later this year. Simutowe stated in an e-mail message yesterday he was energetic at the moment, but still needed to play a few more tournaments before the World Junior which takes place in Armenia from October 27 to November 13. "I will play in the World Junior, but am planning a few others (tournaments)," said Simutowe. Simutowe also confirmed he would participate in the children's Olympiads billed for July/August in Kuala Lumpur, Malaysia. "I feel energetic chess-wise and I know much more chess now, but I still need a certain mind-set to get good results." A few other Zambian players are expected to join Simutowe at the World Junior, but will still need to pass selection trials. The national junior and youth chess championships will be held at the David Kaunda technical high school in August to select players for the World Junior.